Cyberricade is a management consulting firm specializing in the commercial and government sectors. Previously they were using a well-known website and hosting provider. Their services included: website design, website hosting and email hosting. Their monthly costs were high and they were unhappy with the services. Cyberricade came to us looking for a complete website redesign. Cyberricade had a few of issues with their old digital agency. Their website was outdated and not mobile-friendly. It was very difficult to complete simple website requests. The monthly costs were high for such poor customer service. 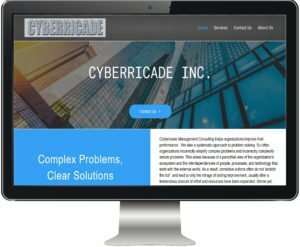 We worked closely with Cyberricade to learn about their vision for their new website and the custom design they were looking for. We created a personalized website package and constructed a detailed action plan. Here’s an overview of Cyberricade’s Website Redesign. We backed up all of the old website’s content and all emails from multiple email addresses. Then we migrated the domain and email accounts over to our preferred host (Siteground). We took what we learned in our kick-off meeting and designed a sharp, mobile-friendly website. Cyberricade was pleased with their new website redesign and thought it represented their business appropriately. All of their minor website requests have been completed in less than 24 hours with our Maintenace Service Package. They now pay a quarter of their previous monthly cost. Check out Cyberricade’s Website Redesign. If you’re ready for Zreux to redesign your website, click here to contact us and get started.